World’s Steepest Mountainside Railway Opens in the Majestic Swiss Alps – Sig Nordal, Jr.
December 23, 2017 December 24, 2017 Sig Nordal, Jr. If you don’t suffer from vertigo and are looking for a little thrill, you may want to book your next trip to Switzerland, which has just opened the world’s steepest funicular. Connecting the town of Schwyz with the Alpine village of Stoos, the funicular climbs at a maximum gradient of 110%. The newly opened StoosBahn is fourteen years in the making, climbing a height differential of 2,440 feet over the mile-long track. The StoosBahn’s barrel design has an automatic leveling system that allows the cylinders to rotate, ensuring that passengers remain level, even at the steepest gradient. A total of 136 passengers can fit in each car to enjoy the quick 4-minute ride. The project opened two years past schedule at a cost of 52 million Swiss francs ($53 million), but the StoosBahn is still a point of pride for the railway company. We should point out, that although the StoosBahn is the world’s steepest classic funicular railway, there are other railway systems that have it beat. A classic funicular is a system where two trains connected by a cable pass each other halfway down the track, balancing each other out in a manner that lets the system function without much force. The Scenic Blue Railway in Australia has a gradient of 122%, but is an inclined lift—meaning it operates as a single train that moves up and down on a winch. The StoosBahn funicular in Switzerland reaches a gradient of 110% as it ascends one mile to the Alpine village of Stoos. 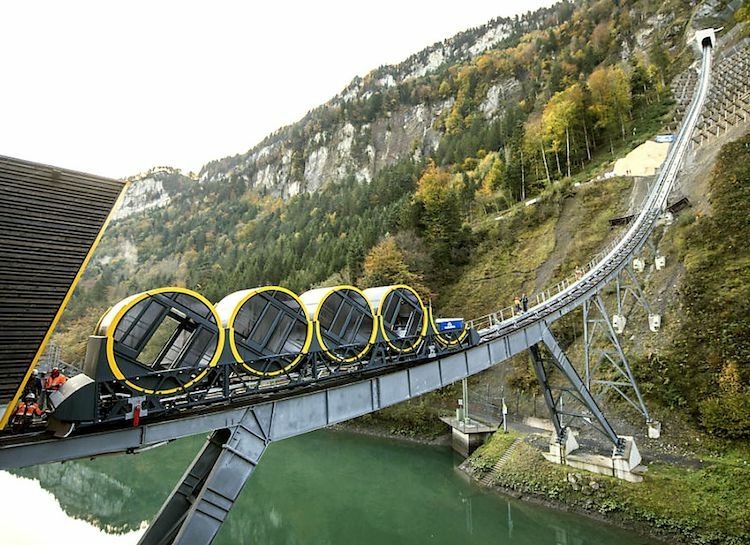 Watch the StoosBahn, the world’s steepest funicular, as it makes its ascent. The post World’s Steepest Mountainside Railway Opens in the Majestic Swiss Alps appeared first on My Modern Met.